Spring is finally here in Indianapolis! We're enjoying the mild weather and between rainy days, Aaron is getting lots of planting and yard work done. We had a low-key Easter weekend. We planned to get in the spirit by doing an egg hunt in the yard, but with the cool rainy day we just put our her Easter eggs in the house. She loved it! Daycare made a cute paper sack version of an Easter basket and it had plastic eggs filled with baby snacks. 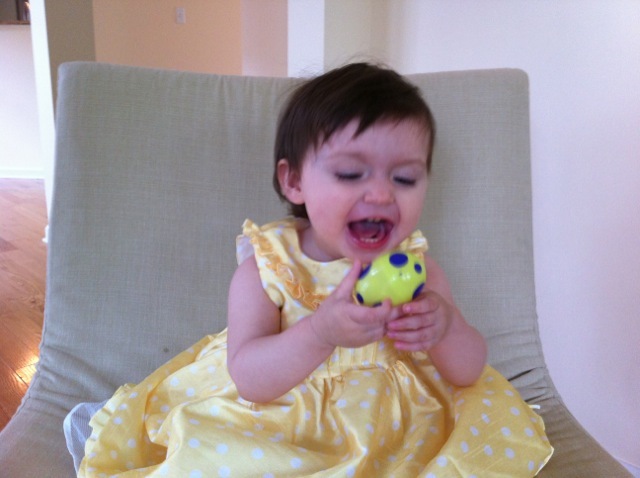 Because of the fun noises the eggs made, Ava shook them up like musical instruments. 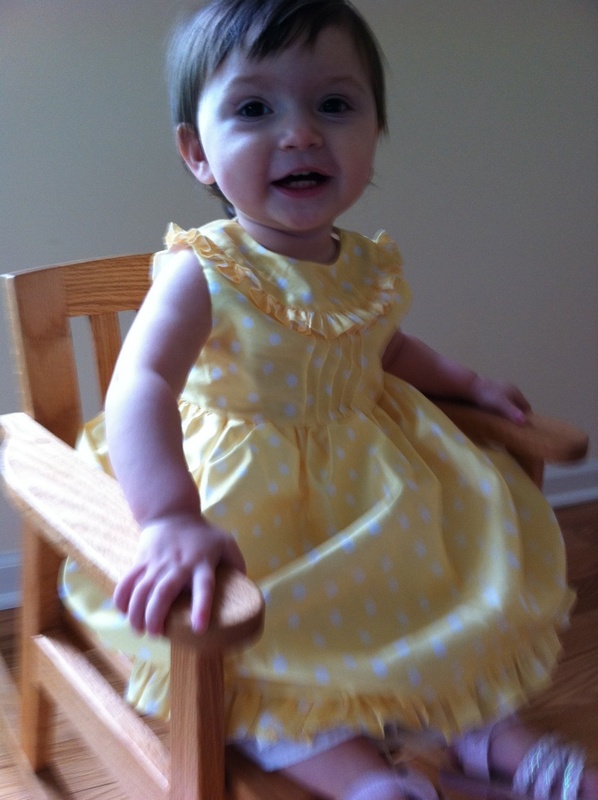 We got this dress for Ava's birthday from our friends Kylee and Brittan and we just love it on her. 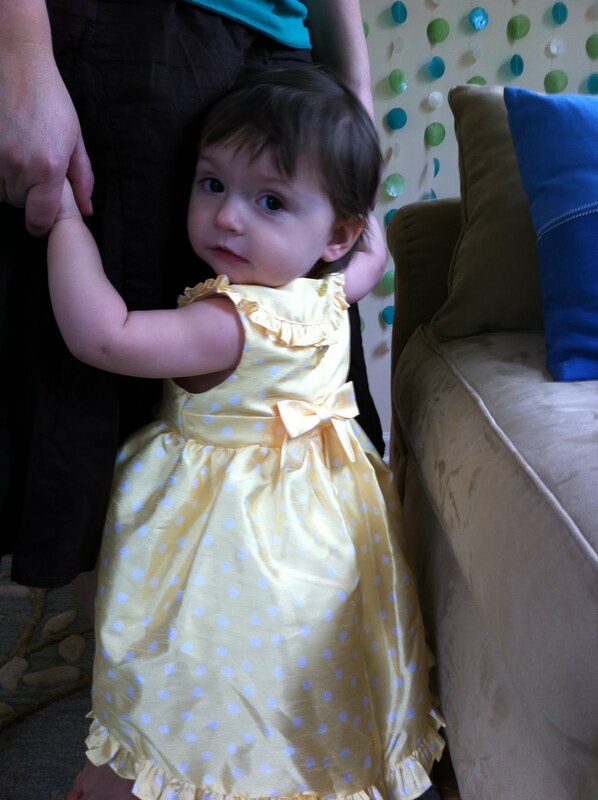 It was a perfect Easter dress. Ava is having fun these days moving all over the place! She is an accomplished scooter. 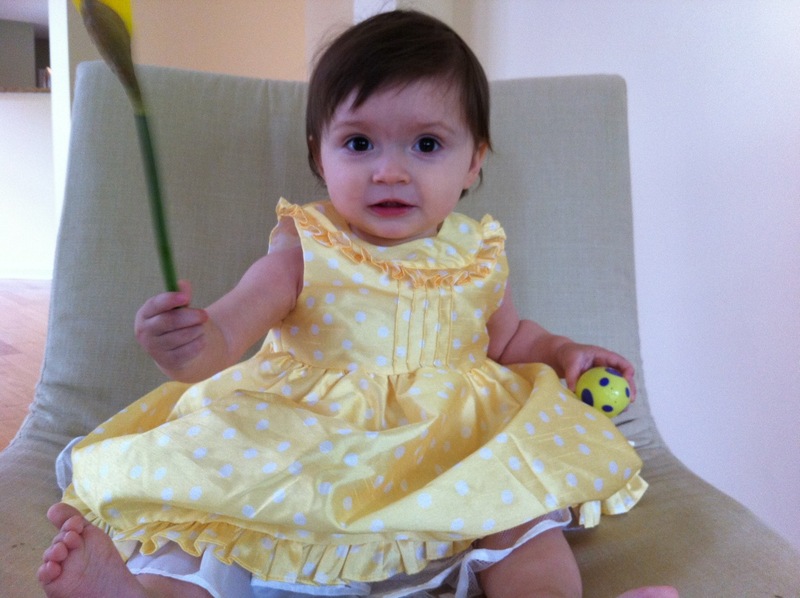 Ava scoots on her bottom very fast and has even mastered holding two toys as she scoots around on the floor. 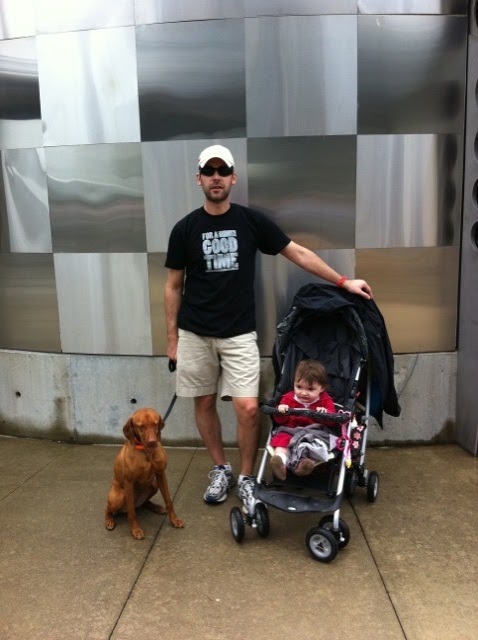 She does a little cruising, but mostly prefers to have hold on to our fingers, very tightly, and walks all over. In fact, she likes to walk up the stairs that way! Baby gates don't fit on our wide stairway so we have to use the baby gate to keep her in her bedroom or ours. Ava likes to sit in her rocking chair and inch down to stand up. Sometimes she stands up and freaks out because she realizes she's not holding on to anything. But she's really stable actually. Now that the weather is milder, she enjoys going outside to look at the new flowers and leaves on the trees. Our girl loves the wind and likes to watch the leaves move in the wind. We can see her comparing the trees in the yard and she wants to touch the leaves on the bushes. Slowly but surely, Ava is becoming more adventurous with foods. She is a huge fan of fruit and yogurt. We buy our yogurt by the 32oz tub because we all eat it. By far, her favorite is mashed banana with plain yogurt with a touch of maple syrup. She loves beets, which are a great source of iron, and sweet potato, carrot-dried apricot puree, and homemade cinnamon applesauce. We've discovered that she likes almond and peanut butters. I mix the almond butter with her banana and yogurt sometimes. We're encouraging Ava to do self-feeding by offering her what we're eating for dinner. And lately, she has started to enjoy pineapple, orange slices, wheat pretzel sticks, and freeze dried strawberries. I put olive oil in her food to add some good fat to her diet. We discovered that she is sensitive to mango and papaya, though. I'm amazed by how much Ava has added to mealtimes because it's only been a couple months that she wanted to eat solid foods. Still, she prefers to nurse most of the time when we're together so most of the solid foods she eats is at daycare. 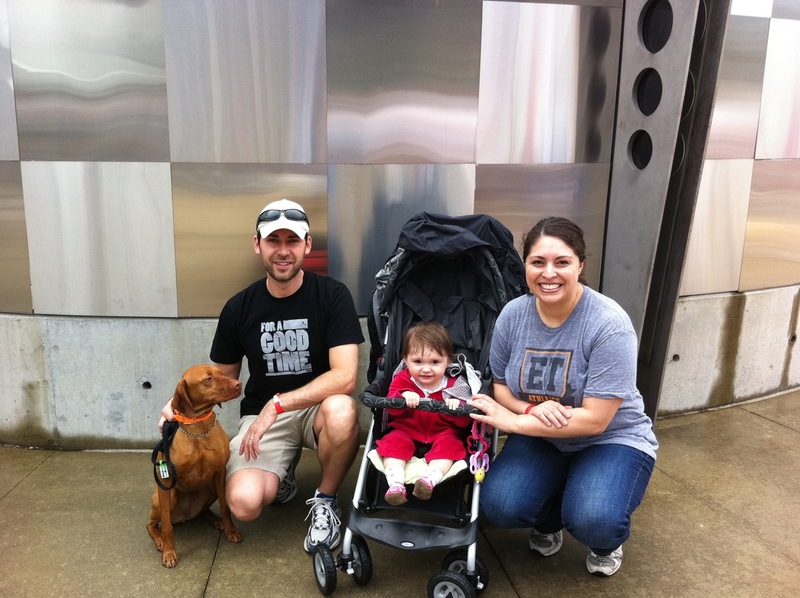 Last weekend, we participated in the Mutt Strut charity walk on the Indianapolis Motor Speedway to bene fit the Humane Society. 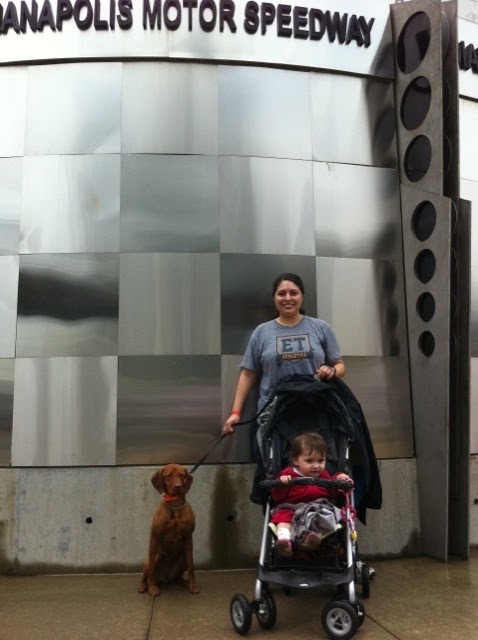 With our 3-year old Vizsla, Bena, and 13-month old, Ava in the stroller, we walked the 2.5 mile "Track." May is a big month in Indy with the 500 Indycar race on Memorial Day weekend. With Aaron's influence, we are all racing fans now! We took these pictures at the winner's podium. Even thou gh it was a rainy day, we enjoyed the rare access on the track! Here's a peek at last year when Ava was the Indy 500 Queen at her daycare. Aaron is going to the Indy 500 qualifying in a couple weeks and we're hosting a house-full of friends on Memorial Day weekend for the big race weekend. Usually Aaron camps out with the guys, but this year he's having a tamer weekend like a true Indy local. They'll get to the track about 6am and tailgate before the race starts at noon. I'm planning to have my own "Girls Indy 500" viewing party here at the house with Ava and our friend, Lauren, who's coming with her husband for the race from Chicago. Ava learned to blow kisses to say goodbye this week! She is saying new words all the time, too! She can clearly say Bena now. Her favorite words are: dada, mama, dog, Bena, and bye-bye. At daycare, she's obsessed with a fish decoration that hangs from the ceiling and after hearing the word fish many times said "fi." She is now pointing at things she wants to know about and says "dat" to ask what it is. We did an entire grocery shopping trip last weekend doing that routine. It's fun to see her curiosity develop! I've been trying to get more sleep! I blogged a few weeks ago that I've been getting very little sleep since I'm working and doing a couple other important jobs - being a mother and wife. I know moms do it all the time all over, but since I'm only 13-months into motherhood, I'm still finding my balance. Ava sleeps well, but I have a hard time getting to sleep at night because it's my only "free" time. I say free, but really I spend it reading, doing chores, making lunches, blogging, or working. Then get up early for the next day all over again. I've been making an effort to get sleep and Aaron has been reminding me to get sleep and leave things alone. On that note, I'm going to sign off so I can go to bed! We have a busy May coming up and I'm so excited for summer!